If this is your first time chartering a bus, or if it’s been a while since the last time you did, we’ve composed a list of Frequently Asked Questions and Answers to help you through the process. We do the driving. You’re free of the hassles of traffic, road maps, parking and backseat drivers. You’re finally free of distractions and responsibilities; free enough to enjoy the travel while a professional driver handles the wheel. Finally. YOU can see the sights. What good is it to drive through the scenic mountains and deserts and villages of the Nation if your entire field of view is a broken white line or the bumper ahead? In a motorcoach, your own panoramic window is a magic carpet. Sleep if you’d like. Today’s luxury motorcoach provides you with stylish and comfortable recliner seats. This is what luxury travel used to be like. Socialize with friends. If you’d rather visit with friends and fellow travelers, you can do it virtually any time you feel up to it. There’s no better way to meet new acquaintances or to enjoy the company of old friends than the adventure of travel together. Enjoy a movie. Can’t sleep? Not up to conversation? In most cases, you can now enjoy a full-length feature film or videos of your group’s own activities while you travel. Door-to-door service. Your charter coach can go where you are and take you to where you want to be. There’s no substitute for the tremendous convenience of a motorcoach’s door-to-door service. Nor is there a substitute for the security and peace-of-mind which comes from that service. You don’t have to worry about dark parking lots in strange cities or shady characters on street corners. Consider the environment. Seeing America responsibly also means leaving the beauty intact for the next visitors. Today’s motorcoach has become both fuel efficient and environmentally-sound. On a per passenger basis, a modern motorcoach is among the cleanest modes of transportation in the world. That’s especially important when your group travels through America’s majestic National Park system. 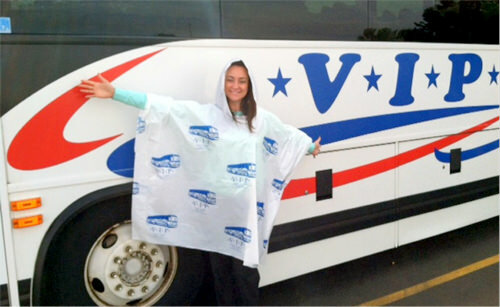 Safety…Safety…Safety… In the world of the professional motorcoach industry, there is nothing more important than safety. Accident statistics maintained by the National Highway Traffic Safety Administration (NHTSA, part of the USDOT) bear this out year after year. According to their records, you were 1,097 times more likely to experience a fatal accident in your own car during 1994 than aboard a motorcoach. You love to be surprised. Frankly, if your last trip by motorcoach was more than five years ago, you have a treat in store. This isn’t the bus you rode to grammar school or home from college. This isn’t the way you came back from visiting Aunt Agnes. Today’s European style motorcoach is a delight. And as America’s professionals, we’ll delight in surprising you with it. We‘ve decided TO BLOG! We’ve been in business for 31 years and we’ve got plenty of stories, experiences and travel tips to keep you entertained. My name is Maureen and I’ll be you’re handy, dandy #BusBlogger. You may hear from Jason, Lana or someone else in our crew, too! Hopefully we’ll make you giggle, share some information you didn’t already know and provide some insight into our industry. Stay tuned!